New book, 64 pages, ELI185. After the fall of the Western Roman Empire there was a decline in 'professional' cavalry forces, and infantry dominated in the Germanic successor 'barbarian' kingdoms. In the Carolingian and Norman periods from the 9th to the 11th centuries, the cavalry arm gradually expanded from the small remaining aristocratic elite. Even so, the supposedly complete dominance of the 'knight' in the 12th and 13th centuries is grossly exaggerated, as integrated cavalry and infantry tactics were nearly always the key to success. This is a two-part treatment of medieval tactics. Throughout the period there was a steady evolution of training in both individual and unit skills, of armour and weapons, and thus of tactics on the battlefield. This book covers Hastings in 1066 to Legnano in 1176. 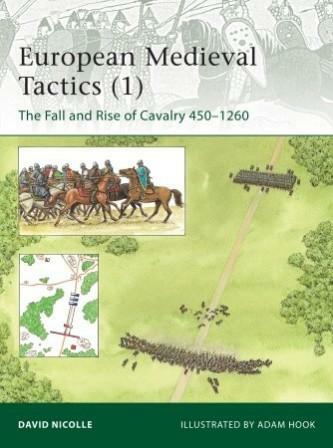 It also details the two key set piece battles of Bouvines in 1214 and Pelagonia in 1259, the former an example of abject failure of cavalry tactics and the latter a stunning success.